While killing time in our local antique mall - a.k.a.flea market - I came across this old Sunbonnet Sue quilt marked $150.00. I took it off the rack and noticed a number of what I call "old age" stains on it, so put it back, walked sadly to my car, and drove to my PT appointment. Afterwards, being that I would not get it off of my mind, I went back to the store and started looking at it again. Knowing that summer would be here soon and I could lay it out in the sun with some diluted lemon juice, I decided to go up and ask my friend, Oliver, what was the best deal was he could give me on it. He called the owner and came back with $75.00. I almost flipped, and of course I said...SOLD! It is in WONDERFUL condition, all the precious prints are so old and beautiful, it is all hand sewn with perfect tiny stitches, and the stains I can work with in time. Why do I work at 72? Well, this is one of the reasons why....so I can treat myself to things like this every once in a while to bring joy to me and brighten our home. Buddy was ecstatic when I brought it in the house, and now it hangs proudly in our sun room. We love it, and the day of work it took me to purchase it was well worth the effort. Rednesday at It’s a Very Cherry World. Genie~this is a wonderful post, I can so identify with working as a senior because you want to have some fun money to buy amazing items like your quilt! What a great find. I think you should post a picture of it in your sun room! Such a sweet quilt! You got a deal!! I don't have a sunbonnet quilt, but I do have sunbonnet blocks that I made for someone else in a quilt block exchange... I should post pictures of those soon. Such a beautiful quilt and a wonderful buy! I have a sunbonnet sue that my great grandmother made I need to do a little patching around the edges of a couple of them. I love this pattern. Good for you working for mad money!! You made the right choice in this quilt. I have three Sunbonnet Sue's quilts and I love them. I would have bought it too. Suzanne(Coloradolady) knows how to get the stains out. I love yours. O this is so beautiful! I now know what this little figurine is called! I have a ceramic one hanging on my wall! what a treasure! 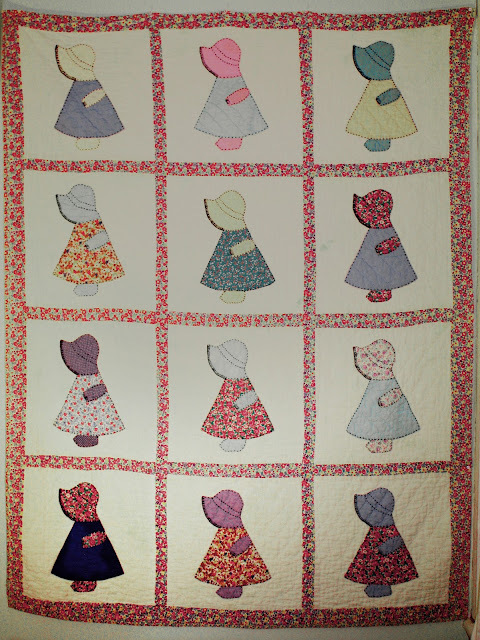 I remember having a sweet sunbonnet sue quilt on my bed as a child. I'm happy you found it and brought it home. What a great find and such a sweet quilt. Oh what a great find Genie. You so deserve it. You work so hard and it's good to treat yourself once in awhile. Sorry I haven't written lately. Gosh, never enough time. Only 34 more days of school. Yippee. I bet you are counting as well. My Mom is doing well. I hope to spring her loose from the rehab facility maybe this week-end. Her surgeon yesterday said she was amazing. Oh it is just glorious. I love and adore that quilt Genie..way to go girl!! Nothing, of course, against you! What a lovely quilt. And yes, work should provide a few "luxuries" along the way. so these are called bonnet sue. I made a traditional Queen Size Chinese quilt for my older girl when she was 6. She still has it. The I bought a small cot size Bonnet Sue for the number two daughter. as she grew older, I added edges to make it a single size quilt. All the time, I didn't realise she thought I made the quilt. In fact people thought I made it. When she was twenty, i told her, and she was very upset. I said, but I never told you I made it. And she said, you made one for big sis. What a treasure, Genie. I would be thrilled with such a find, too. Seems like I have some sort of sun bonnet thingie tucked in my daughter's childhood keepsake memories. I'll have to go digging. It sounds like a terrific deal! Thanks for your visit to my mills. Yes the little closet in the corner is a bed box for two persons. There was actually also a shelf for a baby cot in it.The miller who used to live there told me that he and his brother had to sleep on a higher floor, which was so cold and draughty that they had snow and ice on their blankets in winter.These mills were used to pump the water out of the land into the canal in order to prevent the people from drowning as the surrounding country is below sealevel.